Legislative Roundtable provides a setting for dialogue to take place on public policy issues and gives public agency staff, elected officials, their staff and businesses an opportunity to network. The meeting has a guest speaker on a public sector topic and regular updates from our local cities, agencies and elected officials. Staff members provide brief reports from their prospective agencies to inform each other and members of the chamber of upcoming events or other items of interest. Tim Hagel is assigned as the Chief of Police for the City of Thousand Oaks. 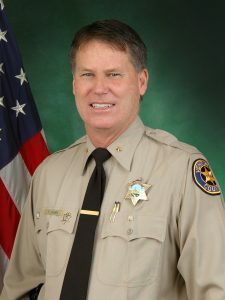 Tim has been employed with the Ventura County Sheriff’s Office since 1987. He was born and raised in the City of Thousand Oaks and after graduating from Thousand Oaks High School he attended Moorpark College. Tim transferred to the California State University system and attended Humboldt, Northridge and Dominguez Hills Universities. He graduated with a Master’s Degree in Public Administration. He began his career with the Sheriff’s Office as a volunteer Reserve Deputy and was assigned to the Thousand Oaks Police Station. Since then, Tim has worked in every Division in the Sheriff’s Jurisdiction including assignments in the Sheriff’s Helicopter Rescue Unit, four different jails, patrol services in Fillmore, Thousand Oaks, Moorpark and nearly all of the unincorporated communities. In addition, Commander Hagel has worked assignments as a detective in felony investigations, narcotics and the internal audit unit. For many years he was the Search and Rescue Coordinator and Emergency Operation Center Planning Section Chief. Tim was assigned as the Chief of Police for Fillmore and later the Commander of the West County Patrol Services where he has oversight of unincorporated communities from Lockwood Valley to the ocean, including the Santa Clara, Ventura and Ojai Valleys. He also managed the Sheriff gang unit, office of emergency services and the county 911 center. Commander Hagel is a recipient of the Medal of Valor and the Ventura County Innovative Manager of the Year.